May, for me, is all about the rhubarb. Ade grows several varieties in the back garden and up at the allotment, so there’s always a generous supply of pink, potent stems in the kitchen at this time of year, waiting to be transformed into something delicious. I’m in raptures over my latest creation: a creamy and indulgent no-bake cheese cake with a zingy rhubarb and lime topping. It’s heavenly. The tangy flavour of the fruit offsets the sweet cheese filling beautifully, and the contrast of bright green zest against the pink rhubarb makes the whole cake dazzle! With the rest of the rhubarb, I plan to make a batch of Rhubarb and Ginger Jam; it’s always my first jam of the season, and happens to be one of Ade’s favourites. I’ll also be stewing up rhubarb with cinnamon and honey to spoon into porridge or Greek yoghurt, and making my Rhubarb & Banana Squares, a family favourite which featured in last month’s The Simple Things Magazine. But until then, if you need me, I’ll be burying my face in this cheesecake. Heat the oven to 200C (180C fan) and grease and line the base of a 20cm springform or loose-bottomed cake tin. Chop the rhubarb into 1-2cm rounds and place in a single layer on a baking tray. Sprinkle over the sugar and squeeze over the juice of half a lime. Remove the tray from the heat and allow to cool. Meanwhile, blitz the biscuits in a food processor (or seal them in a food bag and bash the hell out of them with a rolling pin!) before mixing thoroughly with the softened butter. Press the biscuit mixture into the base of the cake tin, then pop in the fridge. Drain a tablespoonful of the pink syrup from the roasted rhubarb tray into a mixing bowl. Add the cream cheese, icing sugar and vanilla extract and beat together. Lightly whip the double cream and fold this into the mixture. Spoon the cheesecake filling onto the biscuit base and smooth the top. Chill for at least four hours, ideally overnight. Pop the roasted rhubarb into an airtight container and refrigerate. 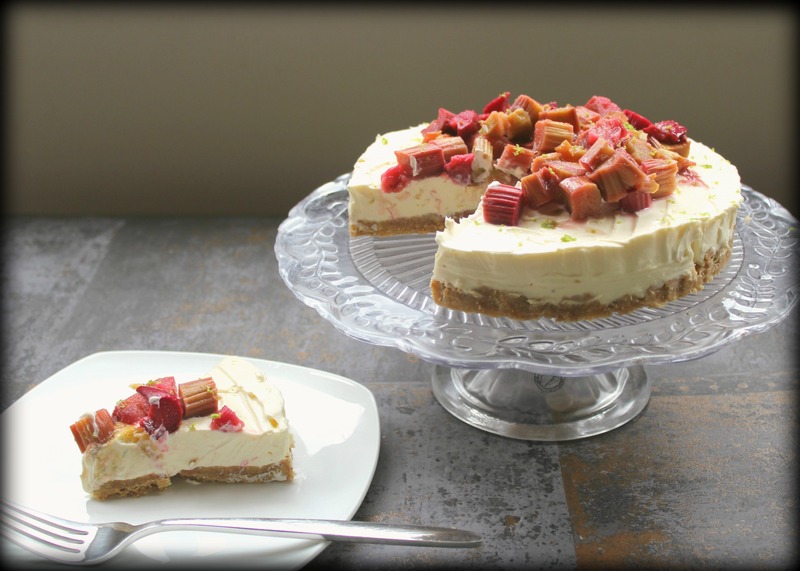 To serve the cheesecake, remove it from its tin and spoon the roasted rhubarb mix on top. Finish with a grating of fresh lime zest. What beautiful photographs, and the recipe sounds divine – can’t wait to have a go. Somehow we didn’t manage to get our act together when it came to getting rhubarb for the Quest for Veg plot. Will definitely save this recipe for when we do. It looks amazing! Rhubarb and lime: now there’s a thought! I honestly feel like I recently re-discovered rhubarb. I hadn’t had it for so long and then someone made a cake with it and I was sold. Can’t say I’ve ever had the rhubarb-lime flavor combination, which makes me all the more curious! I currently don’t have an oven, do you reckon there’s another way I could prepare the rhubarb? Either way, thanks for sharing. It looks delish! Hey, thanks for stopping by! You can stew the rhubarb gently if you don’t have an oven to roast it. I rather like roasting it for recipes like this as it holds its shape better, but a stewed rhubarb topping would be just as delicious! Thanks for sending the Only Good Eats link, we’ll check it out! Oh great idea! I’m not too familiar with rhubarb (in terms of using it myself) so I can use all the help I can get. Loving that idea though. I’ve got to try this out. Fantastic, hope to see you there! Your rhubarb is wonderfully pink, Sophie – which varieties does Ade grow? I didn’t know much when I planted mine and most of the stems are more green than pink! I’m thinking I’d like to start again. I’ve been looking for recipes to use my rhubarb in- this sounds just perfect! Come, sit down, have a cuppa! We hope you enjoy mooching around the Agents of Field HQ. All text, images and content on this site are © Agents of Field unless otherwise stated. We kindly ask that you don't copy anything from this site without seeking permission first. We may occasionally work with brands whose products and services are closely aligned with the Agents of Field ethos. We only ever promote items we can genuinely recommend and only endorse brands we truly identify with. Paid for or sponsored posts are clearly identified, we always disclose where products have been gifted to us for the purpose of review and we always give our honest opinions on such products. Follow Agents of Field and receive notifications of new posts by email.